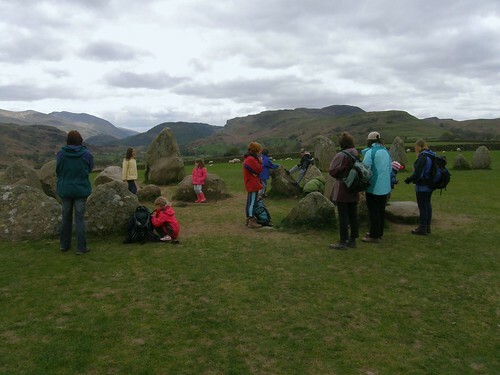 Castlerigg stone circle, a stop of on our Sunday walk last weekend. A lazy and very pleasant Saturday morning spent on the campsite and then an ill-judged walk in the afternoon over Low Rigg in what soon became a torrential downpour yielded no photographs. Sunday was bright and clear but with a very cold wind. From the stone circle we took a stroll around the valley of Naddle Beck, which also yielded no photos, principally since I was carrying S on my shoulders and so had no hands free. We found an excellent sunny and sheltered spot to enjoy our lunch and then shortly afterwards I left the party, who were heading back to the campsite, once again via Low Rigg. 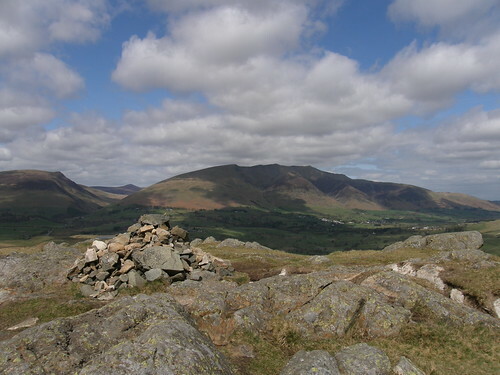 I turned in the opposite direction to climb the long low ridge of Naddle Fell, High Rigg and Wren Crag. Blencathra from the summit of …. The first, northern most top is the highest and is unnamed on the OS map. 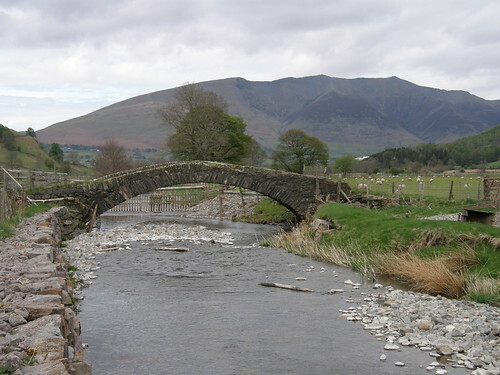 Birkett says that it is locally called Naddle Fell, where as Wainwright calls this High Rigg. Not to worry. It’s a broad ridge with lots of humps and hollows to be explored and I suspect after a less dry April there would have been a few boggy sections to endure. 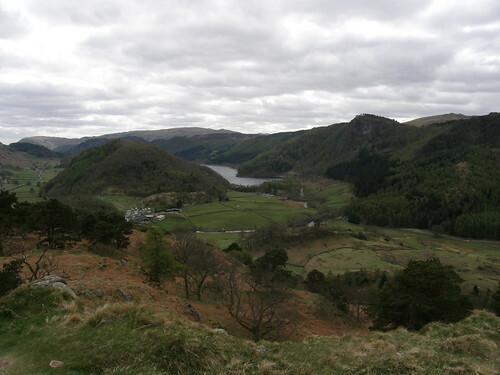 From Wren Crag I descended to pick up a path which follows the valley of St John’s Beck back to the campsite. 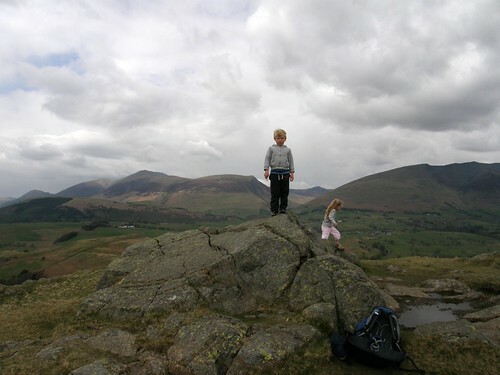 On Bank Holiday Monday I almost repeated the same walk, crossing Low Rigg and then the High Rigg ridge, but this time in the company of lots of kids and their Dads, and my childless friends GP and Uncle Fester. B on the summit of Naddle Fell. Or High Rigg. We had a very pleasant day with great company, some sunny spells and the showers at least held off until we made it back to the tents. The walk was probably about seven miles which is as far as A or B have walked before (S went home with his Mum) and they managed it without complaint and without flagging. This walk boosts my Birkett total for this year to 8, or 11 if I’m allowed to count the fact that I did the same three twice.